Social media propaganda. Data-mining. Foreign interference in Ireland's abortion referendum. The backlash against our rights goes online. The backlash against sexual and reproductive rights is also online. Photo: Dominic Lipinski/PA Images. 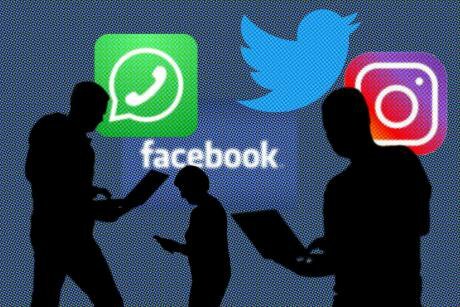 All rights reserved.For our fifth episode of the Backlash podcast, we take a deep dive into the murky world of social media targeting and how anti-rights groups are increasingly taking their fight against women's and LGBT rights online. We talk to 50.50 fellow Sophie Hemery about her investigation into how some evangelical Christians have used online platforms to target LGBT young people with 'dehumanising' videos. Campaigner Liz Carolan explains how activists in Ireland managed to force greater transparency on targeted adverts ahead of that country's abortion referendum. And we hear from openDemocracy's editor-in-chief Mary Fitzgerald about what it means for democracy when powerful groups can so easily target us online. Lara Whyte (LW): Hello and welcome to The Backlash, a podcast series tracking threats against women’s and LGBT rights, brought to you by 50.50, the gender and sexuality section of openDemocracy. I’m Lara Whyte and I am your host. Grassroots, intersectional, feminist campaigning is how we realise our rights. Supported of course by investigative journalists doing their jobs. This month we wanted to take a look back at Ireland’s historic referendum to legalise abortion as it was a rare moment to celebrate and one that we here at 50.50 spent a lot of time working on. As part of our investigation into how international actors from all over the world gathered to support the "No" campaign, we learned a lot about how Facebook and Google adverts can be targeted directly into your newsfeed. They didn’t win, but these groups flexed new muscles, and its important to understand how these groups often do win on social, and how we can fight back against them. Coming up we will be discussing the referendum and the online tricks played by the No campaign with Liz Carolyn from the Transparency Referendum Initiative (TRI) in Ireland and openDemocracy’s editor-in-chief, Mary Fitzgerald. First, I am delighted to welcome our feminist investigative journalism fellow Sophie Hemery, who dug into the different ways LGBTQ+ individuals are targeted online by evangelical Christian groups who disagree with their right to exist. 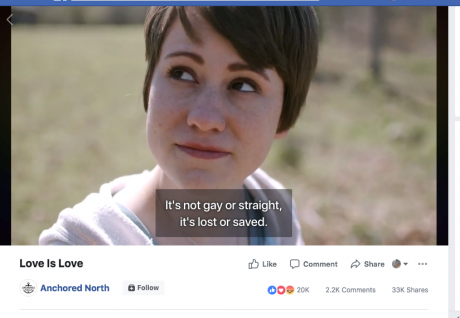 She investigated a group called Anchored North, who make highly shareable, beautifully crafted videos that hide the ugliness of what they are actually saying. Sophie began by explaining how this Christain ministry use and abuse social media to spread their message of hate. Sophie Hemery (SH): So they use various social media platforms and one of their founders Greg Sukert told me they’re always innovating and always looking for kind of new ways to reach people but, currently, they mainly use Facebook and also Google ads via YouTube. And they just use the standard paid advertisement capacities that are available on these platforms to kind of micro-target their adverts at what they call ‘interest groups.’ But those interest groups are basically potentially vulnerable communities, for instance, LGBTQ+ people or women seeking abortions. SH: So I found that, previously, Facebook was allowing advertisers to target adverts based on [users'] stated sexual preference. However, they did remove that ability a while ago but then people like Anchored North were using the ability to target based on groups that users had clicked ‘Like’ on Facebook. So, for instance, if they had clicked ‘Like’ on Pride or Planned Parenthood, they would kind of deduce likely characteristics about those people and target adverts accordingly. Due to recent scandals over user privacy and how Facebook was using users’ data, Facebook actually removed over half of these targeting options, which potentially could have kind of impeded Anchored North’s capacity to target adverts in this way. But, speaking to the founder, he said this basically hasn’t affected their ability to target these groups because of other capacities that Facebook offers paid advertisers. He said it’s basically changed nothing and they’re still allowed to target these people. LW: How much of their business model was based on Facebook, do you think? SH: Facebook is the main platform they use to target people, yeah. LW: And did you find anything else out about how, you know, this type of targeting works on Google? SH: So they also use YouTube and they’re able to target people who are searching for certain keywords and this has kind of been an increasing scandal on YouTube. Because YouTube is often where young or recently coming out or soon to come out LGBTQ+ people watch videos and it's, according to an organisation we spoke to, LGBT Tech, YouTube can provide kind of a safe haven for LGBTQ+ people, in particular, looking for supportive content. And Anchored North and other similar organisations’ adverts were coming up before these videos as pre-roll content and certain users on YouTube had flagged this and, yeah, having spoken to the founder of Anchored North, he explained that that was, you know, something that was really great for them. You know, an anti-abortion video could come up before a supportive video about abortion or, similarly, for LGBTQ+ content, a gay conversion therapy video could come up before that content. An anti-abortion video could come up before a supportive video about abortion, or for LGBTQ+ content, a gay conversion therapy video could come up. LW: So you watched a lot of these videos, I know, and really, are they hate? Because the problem is Facebook seems to be saying: 'We can’t control religion' or 'It’s freedom of speech'. What was your experience of watching them? Did you consider them hate? SH: Yes, I do. But I think organisations such as Anchored North are very clever. For instance, specifically with Anchored North, you know, among their founders are really expert digital marketers who also work for corporates. Sukert says himself that, you know, Facebook has trouble defining hate speech, he’s well aware of this, and the way that they create their content is designed specifically to get around rules and to fall through the net. They use personal stories because, as Sukert says, Facebook loves stories and they are designed to not violate the hate speech policies. However, obviously there’s so much nuance in that and there is a big difference between somebody sharing their personal story, with no intention to evangelise or affect others, and what they’re doing, which is with that explicit intention. And I think, clearly, Facebook’s policies on hate speech are not taking into account that nuance and it’s only when, through investigations such as this, content and adverts that are violating that policy, that have fallen through the net, then they will remove them. But obviously, that is a completely unsustainable model for keeping users safe. LW: Scary stuff there from Sophie, and you can read her investigation on our website, go to the tracking the backlash page. To refresh your memory: here at 50.50, we revealed how No campaign groups were illegally accepting foreign donations online – and how foreign groups targeted Irish voters with anti-abortion propaganda using social media. It is illegal in Ireland for any foreign group to contribute to an election or referendum campaign. But online spaces, as have heard, seemed pretty much unregulated. Amid mounting concern about foreign groups trying to influence the vote, Facebook introduced a ban on foreign adverts ahead of the vote, and Google banned all adverts. 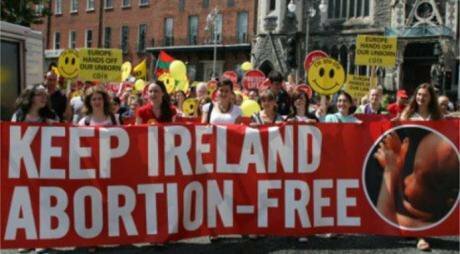 Keep Ireland Abortion Free banner, posted on Facebook by a US group which paid to have it targeted at Irish voters. Photo: Chris Slattery/EMC-Frontline Pregnancy Centers.I asked openDemocracy’s editor-in-chief Mary Fitzgerald, who worked across our investigation and openDemocracy's dark money dig into the DUP, how significant do you think that ban was – and why do you social media companies think they took this step? Mary Fitzgerald (MF): I think it’s hugely significant; it's the first time that had really happened. And it feels important that they publicly recognised their responsibility in ensuring that the integrity of elections and referendums was respected and that national decisions and national conversations should be national decisions and national conversations. However, unfortunately in this case, certainly in the case of Facebook, it was very easy to circumvent their bans. They talked about a combination of human resourcing and machine learning and AI that was going to be deployed to protect the integrity of this vote and yet our journalists were able, in just a matter of hours, to circumvent these bans and post adverts aimed at Irish voters on the Irish abortion referendum question from locations outside of Ireland. And this wasn’t done with any particularly sophisticated masking software or devices or IP addresses, so whatever they claim they were preventing, that they were deploying their vast resources to stop, they weren’t in any way succeeding in doing that. LW: This was clearly not effective, as we saw – yet there’s something that I think got lost in the debate – the tech companies’ self-regulation didn’t – doesn’t – work. What did you think of their reaction? MF: It seemed very knee-jerk. It seemed also that it was a PR effort and actually they weren’t really deploying anywhere near the type of resource that you would need to deploy to be able to make such a ban like this work and make such a guarantee to the Irish people effective. And, you know, at the same time as Mark Zuckerberg was telling MEPs in Brussels about how they were taking all these measures to ensure the integrity of democracy and to help protect it – literally that day, I think – we were posting ads aimed at Irish voters and it was very, very easy to do so. At the same time as Mark Zuckerberg was telling MEPs in Brussels about these measures, literally that day, we were posting ads aimed at Irish voters. LW: There’s also the legal case – which I think was overlooked unfairly: at 50.50, Claire Provost managed to donate to some of the biggest anti-abortion groups, from outside Ireland. And we at 50.50 worked with our colleagues on openDemocracy’s ongoing dark money investigation, digging up so much dirt on how foreign activists were trying to keep abortion illegal in Ireland, that we made it into a listicle. And I suppose the thing that I couldn’t really get my head around was that I understood why Russia would interfere in the US election and why it might have an interest in Brexit, but what I have found difficult is why foreign groups would be interested in Ireland voting to do most other western countries voted to do 50 years ago. Why was it so important, do you think? MF: Yeah, so I think the reason why openDemocracy as a whole is interested in this subject is that we didn’t take a position, let’s say, on the Brexit referendum but we were very concerned about the undisclosed, untraceable sources of funding that particularly appeared to have bankrolled the Leave campaign. We’d done a lot of work exposing the secret donation that was made to the DUP for their Brexit campaign, which was done through a very secretive channel, involving a front company and a bag man and all kinds of nefarious goings-on. And, to us, the question of the Irish abortion referendum raised some similar issues and concerns in that it seemed as though – and it was indeed proven through our investigation that – networks and groups outside of Ireland were able to deploy a lot of resource to support one side of the argument. Screenshot of ‘fake’ Facebook page set up by openDemocracy 50.50 to test the ban on referendum-related ads ahead of the Irish vote. Credit: Facebook.And despite there being rules and laws in place to prevent such things happening and I think despite the result, which was very emphatically pro-Yes – and most of the groups we identified were trying to influence and advocate for the No side, so they didn’t succeed in this instance – there is a much deeper question about how electoral processes can be interfered with. By whom? Through what channels? Are our laws robust enough? You know, do we have the accountability and transparency over political funding and through political campaigning that we need both here in the UK and in Ireland and in other European countries and in the US? And the answer is just emphatically no. I mean, people were able to donate to the No campaign in Ireland, regardless of where they were based geographically, which is in direct contravention of the law. And really, if you broaden this out more, this raises massive concerns. Both the Facebook and Google issue and the funding issue and the sort of boots on the ground volunteers that were coming from all over the world to weigh in on this issue, raise huge concerns about, you know, who is trying to influence what we see, what we hear and what we read: and how successful are they? And what do we need to know about them? There's a much deeper question to be asked about how electoral processes can be interfered with. By whom? Through what channels? Are our laws robust enough? There is a great asymmetry of power here between very well-resourced networks and individuals and organisations and citizens who think that they’re engaging in a democratic vote, you know, in a contest that’s going to be democratically decided. And they’re not aware of all the forces at play that are trying to influence their decision. 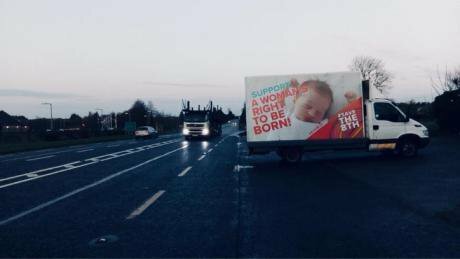 LW: That was openDemocracy’s editor-in-chief talking about the foreign, but ultimately unsuccessful, interference in Ireland’s abortion referendum. And I think some credit needs to go where it’s due here – there was this groundswell of pro-choice digital and activism and in the lead up to the vote. The tone was really gentle, at times I thought it was too gentle, but it worked, so that's the most important thing. There were some really great tactics used that women’s rights organisers should be studying, I certainly hope they are. The Transparency Referendum Initiative (TRI) and their allies did a lot of the heavy lifting in gathering the data that our reporting on 50.50 dug into, revealing the range of illegal foreign and far right contributors to anti-abortion campaigns ahead of the vote. Liz Carolan is a founder of the TRI, advisor at the Open Data Charter, and associate at the Open Data Institute. I asked her how this initiative started. Liz Carolan (LC): Yeah, so a group of friends got together and we sort of work in different areas that all seemed to come together around this question of digital ads. And we were having a chat kind of over Christmas about looking at the different revelations and at that point, it already started to come out about the sort of misuse of social media in order to try to disrupt democratic campaigns. And kind of looking at the Irish abortion referendum and the fact that it’s a highly contentious issue here at home but also of potential kind of symbolic significance to other people around the world. And also looking at our really quite lax laws when it comes to kind of overseas activity. There were a few alarm bells going off there so we decided to try to do a concrete project to, at a minimum, sort of bring some of this activity into the public domain – the activity that was happening online – so it could be kind of exposed to scrutiny. 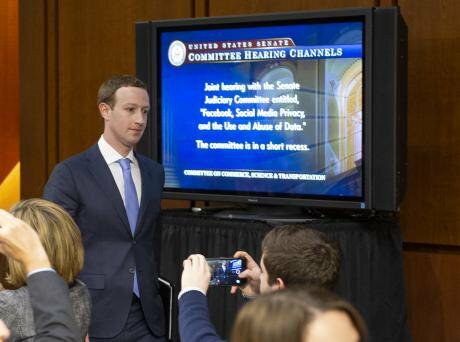 Facebook's Mark Zuckerberg, testifying before a United States senate committee. Photo: Ron Sachs/DPA/PA Images. All rights reserved.I think actually one of the really kind of points when this idea sort of stuck in my mind was watching the US senate testimony, where there was a senate hearing and they were, you know, trying to figure out what had happened in the 2016 presidential election. And, you know, there were these, senators sitting around and they were looking at these kind of blown-up images – they were screenshots, really, or even kind of photographs of a computer – of some of the ads that they were then able to subsequently trace back to Russian interference. And, you know, just the thought that, if, in a context like that, what they ended up using to try to figure out what happened was these, you know, screenshots or photographs or computers – that kind of terrified me a little bit. And so that’s where sort of the idea came from, to (as much as possible) try to gather the evidence in advance, make it publicly available immediately, so that we could understand what was happening before people vote. The idea was to try and gather the evidence in advance, make it publicly available immediately, so that we could understand what was happening before people vote. LW: So why do you think Facebook took the decision to ban foreign adverts ahead of the vote? LC: So when it comes to sort of, you know, why Facebook took this decision: I think they were in a way left with no option. You know, we were able to bring some of the activity that was happening online to their attention, as much as to everyone else’s attention. And I think there was a lot of really, really fantastic journalism that took place using the data that we were publishing, that kind of, you know, really, really put pressure on for some sort of action to take place. I think as well there were quite a few members of our parliament that we were working with who were also kind of raising the issue and trying to figure out what could be done about it. In terms of the action that they took I think, you know, that your experience and the experience of lots of other people indicates that it was pretty ineffective. You know, there was an Irish [pro-choice] group here – they were registered; I was able to pull up their company registration details in about five seconds – who were refused the right to place ads, even though they had fundraised for it; they had done everything correctly. And, even when they appealed to Facebook, there was no moving. We were able to kind of use our channels into Facebook to get that unblocked. So it seems to be that, you know, both: They were getting it wrong in terms of who was Irish-based and who wasn’t Irish-based. And also that, you know, in terms of its application, they didn’t really seem to be that open or willing to engage with people who were clearly being disadvantaged by the moves. I think overall, you know, the sort of attempts at self-regulation just didn’t work. And Facebook talk a lot, like Mark Zuckerberg – when he was speaking to European parliamentarians and to the US congress – he, you know, kept talking about AI as a solution to these problems, as if it was some sort of, you know, magic trick that would fix everything. That was the basis of their response here and it just failed; it just didn’t work, you know. It’s too kind of complicated to do things. And I think there’s an increasing recognition with Facebook and some of the other companies that, actually, they don’t want to take this on themselves. Facebook's ban on foreign ads was easy to circumvent. Photo: FrankHoermann/SVEN SIMON/DPA/PA Images. All rights reserved.In a way, they want legislation and rules there to kind of give them a bit of cover, you know. And we’re seeing that, even in the last couple of weeks, with this resurgence of the narrative around the company sort of censoring conservative or right-leaning groups. I think there’s a sense among the companies that they don’t want to have to do this; and it’s not what they were set up to do, you know. Even now, Facebook have agreed to try to look back through their records and release some data on what happened during the referendum. We’re partnering with them and a university here to get that data. But, you know, they didn’t differentiate between an ad that was trying to change the outcome of a referendum and an ad for socks or flights or something else, you know, because they are a private company and their goal is to sell advertising space. The realm of politics and of public opinion in these sorts of things is something they know nothing about. They don’t have the skills; they don’t have the capability to do it. And so then, you know, it really is little wonder then that when they try to take a self-regulatory step that they just, you know, that it fails. They didn't differentiate between an ad that was trying to change the outcome of a referendum and an ad for socks. 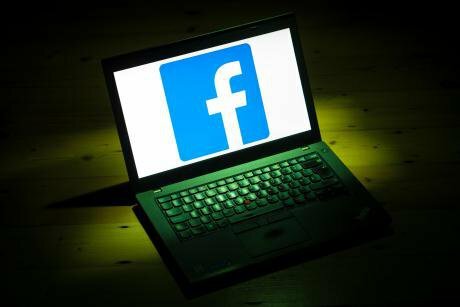 LW: So earlier, we heard how social media companies have been enabling targeted hate to be directed to those who would be most damaged by it, and I wanted to ask you about the kinds of adverts that were being reported to you. Have you been surprised by what you found through the TRI? LC: Yeah. I mean, it’s really disturbing to hear about some of the, you know, the use of this tool to basically attack and hurt people. And we saw that here during the referendum. There were really, really graphic images. There was one of, you know, basically a post-miscarriage scene that was being targeted at women, at young women, and at women who were campaigning. And that, to me, is just a deliberate attempt – and it sounds like some of the examples you’ve been uncovering of the kind of targeting of LGBT people – just a deliberate attempt to hurt, you know; it almost feels like an act of violence. One thing I noticed about those ads that were happening here is that the groups behind the advertising, the targeting, these kinds of things, were anonymous. It was very difficult to trace who had done them. You know, we found that some of the more official campaigns, you know, they would never dream of engaging in that kind of activity, in part because they knew they had to go on the radio the next day and they had spokespeople. But also I think people behave very differently when they can hide behind a mask. In terms of where the companies are on this: I think they – and probably a lot of the rest of us as well – you know, they’re not very far along the learning curve. One thing I noticed about those ads is that the groups behind the advertising, the targeting, were anonymous. I think they’re at the point where, you know, they recognise that they have kind of blindly wandered into a territory, which is dark; it’s, you know, terra incognita in a way. There are all sorts of consequences of the technology that they’ve been building that they did not anticipate. I think, you know, they’re starting to feel that, from what I’ve kind of heard anecdotally from people who work in these companies. They’re starting to feel that, to be honest, in terms of their recruitment and their retention, in terms of their staff morale. You know, people joined these companies thinking that they were joining a force for good in the world and now they’re having to kind of reckon with the fact that it’s being used for ill. I’m not sure to what extent that process, almost like a psychological process, they’ve gone through to get to the point where they can start to think about it. But I think, you know, these questions are… it comes down to questions of free speech, of, you know: to what extent is their identity as a public square or is it their identity as a publisher? You know, these are sort of quite existential questions and I think, to be honest, they would prefer if somebody else just took it on and told them what to do. And, you know, I think I’m with the first to push for a regulatory response to these things, rather than relying on private companies to do some of this work for us. There are all sorts of consequences of the technology that they've been building that they did not anticipate. But, you know, looking at our regulators, they do not have the technical capabilities or insight to be able to do that on their own and I think there is going to have to be some sort of a collaborative response. One thing that I worry about quite a lot is, you know – in the UK, in Ireland, say, in Sweden at the moment, or even in the US – we can rely on our state institutions, to an extent, to respond to this sort of thing, even if it’s slow. And, you know, we can kind of get there in the end with a lot of pressure and hard work. There are plenty of countries in the world where Facebook operates. I mean, look at what’s happening in Myanmar at the moment, where the state institutions aren’t going to be on the side of, you know, the public good. And so we are going to have to rely on these companies who operate in all but ten countries in the world – as Facebook do – to be doing something themselves, to make sure that they have a lid on this. But it’s very tricky and they’re not going to be able to do it with AI. What is the difference between, say – you know, you mentioned earlier an evangelical organisation sort of targeting LGBT people – how can an AI tell the difference between a group like that communicating with its own base about particular issues and an attack ad? There’s so much context in that, you know. There’s so much kind of nuance that’s required to do that. And these companies make billions; they make a huge amount of money and yet they kind of cry that they don’t have, you know, the resources to be able to do some of that more nuanced work and that they’re going to have to rely on AI. I can see why. These companies make billions; they make a huge amount of money and yet they cry that they don't have the resources to be able to do some of that more nuanced work. AI is a bit of technology; you pay your coders and you just kind of let it run. That’s not going to fly. It’s going to have to take more than that. LW: So Google banned all adverts in the lead up to the vote – yet we haven’t heard a huge amount about them in the fall out. Why do you think that is? LC: Yeah, so Google seem to be much more of a closed box than Facebook. Our engagement with Facebook… we were kind of given a dedicated email address; we kind of got the impression that they were, you know, willing to engage or at least that they saw it as important to appear to be engaging with us. Google are much more of a closed box and I’m not sure if that’s because they’ve kind of gotten away with it a little bit – you know, Cambridge Analytica... all the focus has been on Facebook – whereas I think the Google advertising network, and particularly YouTube, is one where, you know, there’s storms brewing there and they’re going to have to get their house in order. I think the Google advertising network, and particularly YouTube, is where there are storms brewing and they're going to have to get their house in order. We have found it quite difficult to engage with them. They still haven’t given a proper reason as to why they – so, two or three weeks before the referendum, they pulled all advertising and this did lead to a very strong reaction, in particular from the No campaign. They kind of called a big joint press conference, which they hadn’t held before and, you know, there was a headline in I think one of the kind of US right-leaning newspapers the next day, talking about Silicon Valley sort of silencing the anti-abortion movement in Ireland. And, you know, you still see it kind of being used, that ban being kind of held up as yet another example of tech companies’ bias against conservative movements. I mean, the ban equally applied to both sides of the campaign and the Yes campaign – so the kind of pro-change, bringing in abortion access – they had planned to launch their Google ad campaign the day that the ban came in. But I think it was pretty clear that this was going to be one of the main avenues through which the No campaign were going to push in the last final weeks. An anti-abortion campaign truck picture, posted on Facebook. Photo: Save the 8th/Facebook.I’ve asked the No campaign to sort of share what they had planned during the last few weeks and the kind of head of that said, “Oh well let’s not get into re-litigating the referendum,” which is convenient because they’re happy to keep using it as an excuse but they don’t want to get into the details of what they had planned. I mean, I think that’s what we really need to know: what was it that Google saw that made them take this decision? Because if it was large amounts of overseas financing coming in then that’s something that citizens have the right to know. But if it was, in effect, an act of censorship of a legitimate campaign then that’s a very dangerous precedent and one that actually we need to have some information around to be debating. But until they give us that information, it is fueling a narrative on the conservative right, you know, here in Ireland, probably to a larger extent in the US, that Silicon Valley is sort of against them. LW: Liz Carolan there, from the Transparency Referendum Initiative, and before that there you heard from Mary Fitzgerald, editor-in-chief of open Democracy, and Sophie Hemery, one of 50.50’s feminist investigative journalism fellows. Before you go, I wanted to draw your attention to some of our biggest stories from the past while on 50.50. 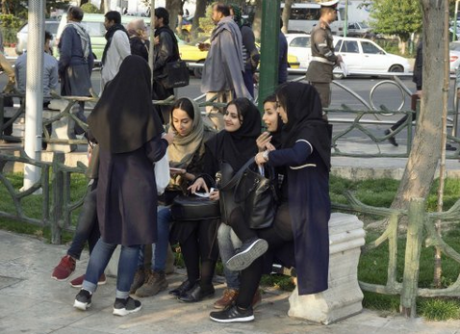 Women in Tehran, 2017. Photo: Jochen Eckel/DPA/PA Images. All rights reserved.We are very pleased to be introducing a new young writer inside Iran, going by the name of Zaynab. Her first piece for 50.50 – Women’s bodies have become a battleground in the fight for Iran’s future – is a chilling read. We also have a lot of great, front line reporting pieces on how women are fighting back against online bullies – all over the world – some good pieces on trolling, and how women are responding. One of these is by Sian Norris on how women are fighting back against online bullies. The other is by 50.50’s Nandini Archer on the angry backlash to our reporting on an international gathering of anti-feminist men’s rights activists (MRAs), and we also have a piece coming up on what to do if you have been the target of hate one – as we in 5050 have over the MRA work we did. Resources that help you feel safer, and how to protect yourself. We here at 50.50 would also like to thank Rocio Ros, who has been working with us this summer and helping us with this podcast, amongst many many other things. She will continue writing for 50.50 from Spain. Thank you Rocio! You have been listening to The Backlash, by 50.50, openDemocracy’s gender and sexuality section. This podcast was presented and produced by me, Lara Whyte, and mixed and sound edited with original music by Simone Lai. Big thanks to our feminist investigative journalism fellows for their work this month, and to Brittney Ferreira, who helped transcribe this episode. 50.50 is an independent feminist media platform. You can find us on Twitter @5050oD, and you can support our work by donating on our website. Help us track the backlash against women’s and LGBT rights. This episode of The Backlash was presented and produced by Lara Whyte. Audio editing and music production by Simone Lai.